Real People. Real Science. Real Impact. The LFVC is excited to reinstate our River Watch water monitoring program with the Lake City Community School in 2015! Please check here for updates regarding this year's River Watch trainings. We invite you to come out and become a citizen scientist and put your new skill set to good use! Adults and young folks over 12 are all invited. Training will begin with a lecture, and end with hands-on instruction in water sampling and chemical analysis. No experience required! If you have more questions about this year's program please don't hesitate to contact our Outreach & Education Coordinator, Stephen Norton @ 781-454-7667, or s.norton@lfvc.org. To thank our River Watchers for their awesome commitment to their community and their excellence as scientists, the Conservancy is developing a program with Bureau of Land Management by which the most proficient team members will be invited join the BLM and LFVC for water monitoring high in the alpine. They'll develop friendships and professional connections within the agency, while learning new sampling protocol and visiting some spectacular streams. At the end of the summer, the Conservancy will also grant our finest citizen scientist a scholarship to attend River Watch teacher training in the fall. Henson Creek is listed as a 303(d) impaired water. 303(d) designation simply means that it is polluted by Clean Water Act standards. More specifically, Henson Creek has elevated levels of cadmium and zinc loosed from abandoned mines via runoff and Henson's tributaries. (The principle of these is the Hough Mine, where LFVC and DRMS finished cleanup efforts in 2014). Henson also has a high sediment load that degrades water quality and negatively impacts our river's ecosystem. As such, our River Water citizen scientists monitor the health of Henson to determine its impacts on the Lake Fork. We monitor three sites, two of which are located within the Town of Lake City. The third site is located downstream of town, and the confluence of Henson Creek and the Lake Fork, at Independence Gulch. 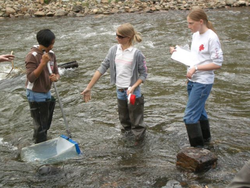 Since 1989, River Watch has worked with volunteers around the state, coordinating volunteer efforts to collect quality water ecosystem data that can be used to monitor and regulate Colorado’s rivers and streams. River Watch has worked with over 70,000 individuals at 3,000 stations and at more than 400 rivers and streams throughout the state. Currently, River Watch works with over 135 active monitoring teams. Their data is used in Denver, helping legislators implement the Clean Water Act. Our new and improved sampling locations are designed to be more accessible and more relevant to residents of Lake City and Hinsdale County. The new sites not only strengthen our River Watch team’s sense of place and awareness of our natural resources, but also support the Conservancy’s Long-Term Monitoring Plan by collecting data on how Henson Creek, a 303(d) impaired stream, impacts the Lake Fork of the Gunnison. Moreover, they will provide data on the effects of our River Enhancement Project, which broke ground in Fall 2013. Colorado River Watch is a non-profit organization that empowers citizens to engage in real science and collect data that is used by legislators to implement the Clean Water Act.